My daughter, Emerson, was sitting in her carseat in the back row of the van as we drove home from dinner one evening. She was four at the time. Discipline was not her strong suit that day, and as evening came she got more and more out of control. She was angry with me because I I had corrected her pretty sternly at dinner. She was scrunched down in her carseat, arms tightly crossed quietly fuming at me. Then I heard her tiny voice, speaking with great energy. “I don’t like you, daddy.” Then she went quiet. Even though she was four, it still stung a bit. It was a little slap at my identity and purpose as her father. A moment later she spoke again, almost like she was rethinking her position. “Well… I like your beard… I just don’t like you.” That was so much better! My beard is magnificent. And since my beard hadn’t been a part of disciplining her, I can understand where she was coming from. Watching my daughter work out her emotions toward me was fun, but her words stuck a chord. I thought about how many relationships I’ve had in my life with people who truly didn’t like me for me. They liked something about me: my performance, my loyalty, how I could support and encourage them. But their love didn’t extend to all of who I am. I also realized that for a long time that’s how I saw God. There were certain things about me that God loved–my good behavior, my worship, my dedication. But there were just so many thing that didn’t line up with God’s wishes; God couldn’t really love all of me! This perspective skewed my sense of identity. If God couldn’t love all of me as I am, then something about me was fundamentally flawed. I’m not talking about sin. I’m talking about the very core of my identity. Without enormous change and effort, I was unlovable. I never thought this consciously; but as I have reviewed my life, it’s clear that I was living this way. This deeply held belief led to a heavy and painful sense of purpose. Somehow–whether for God, or the people around me–I had to work in order to earn my place at the table. My performance was my golden ticket. If I could do a good enough job, enough of the time, I’d be included, loved, valued. So here I was: Identity: Unlovable. Purpose: To perform well enough to be loved. Does that resonate with you? Have you ever felt your life reduced to these terms? I still wrestle with performance-based value, but I’ve come to see God’s love in a different way and it’s radically shifted my sense of identity and purpose. One simple passage of scripture opened up the door to a whole new understanding of myself, and it’s driven a major shift in my life. Here it is: Ephesians 2:10. This verse speaks directly to identity and purpose, two of the things we are most hungry for, and that are so important to me. That first line changed the way I see my identity. “For we are God’s workmanship.” That word workmanship means that you are handcrafted by God. You’re not the result of a factory process cranking out a crowd of identical products. You’re not the result of a random process that has no meaning. But there’s something even better hidden beneath the word that made the passage light up for me. The English word workmanship is translated from the Greek word, poiema. This is the root of our modern word poem. Think about that for a moment. 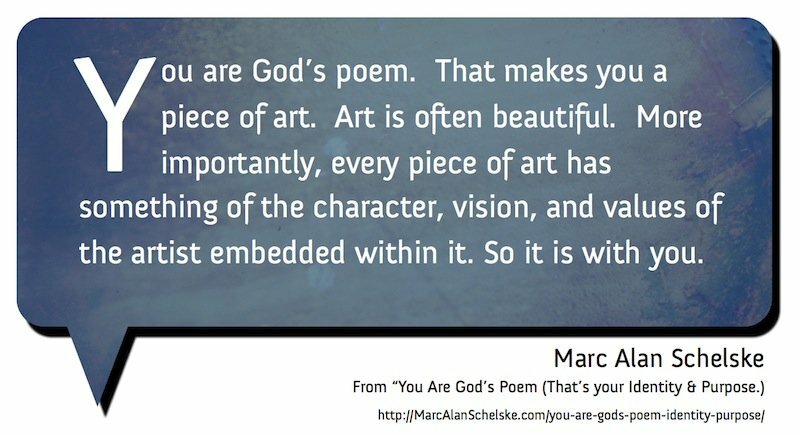 You are God’s poem. That makes you a piece of art. Art is often beautiful. More importantly, every pieces of art has something of the character, vision, and values of the artist embedded within it. So it is with you. The Bible says you were made in God’s image, that you reflect His glory. The trajectory of your life is to mature in the image of Christ. All of that is what it means to be a work of art handmade by God. If you understand that you are God’s poem, it shapes the way you see your purpose. Why is art made? To be beautiful. To compel. To express the vision of the artist. This is all true for you and me, but we’re not art made to sit on a mantle or a glass case, protected from life. We were made to do something. The verses says we were made “… to do good works, which God prepared in advance for us to do.” God made you to express God’s own heart and vision in the world in an active way, to bring good and beautiful things to life. You–exactly as you are–are a part of God’s plan to bless and serve the world. 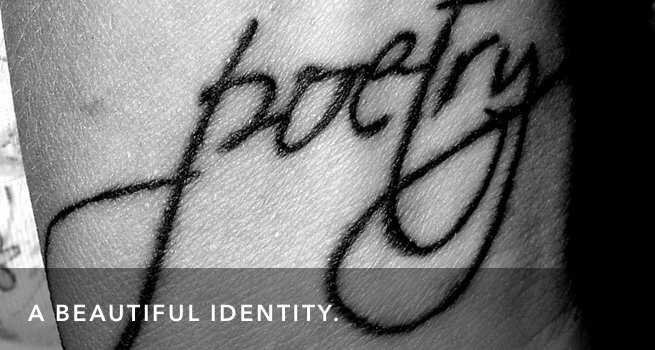 How does the idea of being God’s poem sit with you? How might owning this truth shape your life? What kind of art are you, anyway?